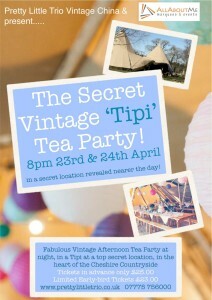 The Secret Vintage `Tipi` Tea Party! On Tuesday 23rd & Wednesday 24th of April the tipi will play host to a relaxed and social evening from 8:00pm. The tipi secret location will provide a stunning back drop for the event; this is the perfect opportunity to experience the tipi first hand, as well as enjoying a delicious tea party with family and friends. The rustic furnishings and pretty vintage deco, the tipi will create a cosy and inviting space for you to enjoy a relaxed secret vintage tipi party. For more information or to book, please call Rebecca on 07775 756000, or email her on hello@prettylittletrio.co.uk. We hope to have the opportunity to welcome you to the tipi this April.